A few years ago I was introduced to romesco sauce. Roasted peppers, almonds, hazelnuts, garlic, tomatoes, parsley, a slice of leftover bread, and olive oil. Wow! I fell in love with the bold, delicious flavor. I made a small batch of Deb's romesco sauce recently, eating it on everything in sight. 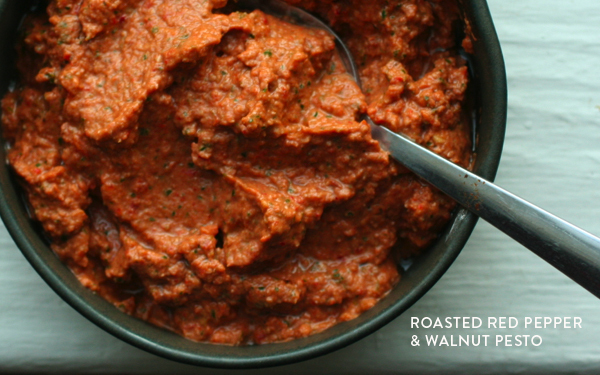 So you'll understand why I'm so excited about this week's Food Matters Project recipe: roasted red pepper and walnut pesto. This recipe is a combination of romesco and pesto. I adapted the recipe by using parsley instead of basil and walnut oil instead of walnuts (husband allergic to raw olive oil). I also added in some chipotle chilies. I think you can eat this on almost anything. 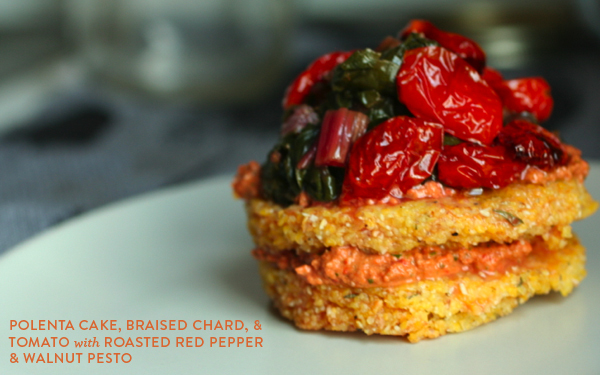 I stirred it into a bowl of hot brown rice and black beans, drizzled it on my eggs, and stuffed it between my polenta cakes with braised chard and roasted tomatoes. Oh and it's a perfect spread for a sandwich or dip for vegetables. Feel free to use store-bought roasted red peppers, but I'd recommend roasting your own (especially when peppers are in season). I roasted my peppers in the oven until they softened, almost falling apart, and were browned on each side. Preheat oven to 450. Place red peppers on a foil-lined baking sheet. Bake for about 45 minutes. Don't worry if the pepper falls apart. Remove from heat, place into a large plastic bag, and let cool. Once cooled, remove peppers from the bag and peel the skin. Add red peppers, chipotle peppers, walnuts, parsley, paprika, garlic, and vinegar to the food processor. Blend until smooth. Add salt and pepper, to taste. Drizzle in the walnut oil and blend for another 15 seconds. Remove and enjoy immediately or refrigerate. Yields about a cup. 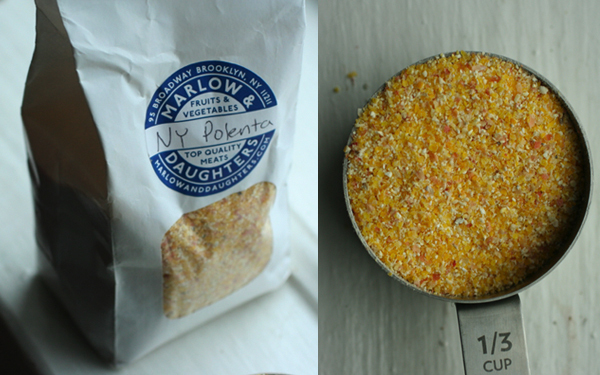 I brought back some polenta from our trip to NYC last weekend. I purchased it at the lovely Marlow & Daughters in Williamsburg. I had some amazing polenta cakes a few weeks ago and was itching to make some at home. I decided to try Bittman's recipe for polenta cakes. Add polenta, herbs, spices, and water to a pot over medium heat. Bring to a boil, reduce heat to simmer, and cook for 10-15 minutes, stirring often. If it's too thick, add more water. Turn off the heat and pour polenta onto a greased baking sheet or 9 x 9 in. dish. Spread with a spatula until it's about an inch thick. Let cool, cover, and refrigerate for at least 2 hours or overnight. Preheat oven to 375. Get out the refrigerated polenta. Cut into triangles, squares, or use a biscuit cutter to cut into circles. Put polenta cakes onto an oiled or parchment-lined baking sheet. Bake for 25-30 minutes or until they start to brown lightly on each side. Remove from heat and top with pesto, braised swiss chard, and roasted cherry tomatoes (or whatever you like). My cakes were a little on the thin side, so I stacked them. Next time I'll make them thicker. Oh and if you prefer them a bit crunchier, pan fry them instead of baking. I've been dying to make polenta cakes and this gives me the perfect reason. How delicious looking! Oh, yours turned out just gorgeous. That polenta cake is a fantastic application. Yum! This does remind me of romesco! Funny enough, that I also tried a la Bittman. Polenta cakes are a great way to go. Love it! This sauce definitely is absurdly multi-purpose! I love that you added some spice to it. Fab idea. This looks so yummy with the polenta cakes. I want to try it now... just delicious! This dish looks absolutely beautiful and I imagine it tastes even better! Definitely going to be picking up some polenta soon. Love your interpretation of the recipe, Adrienne! 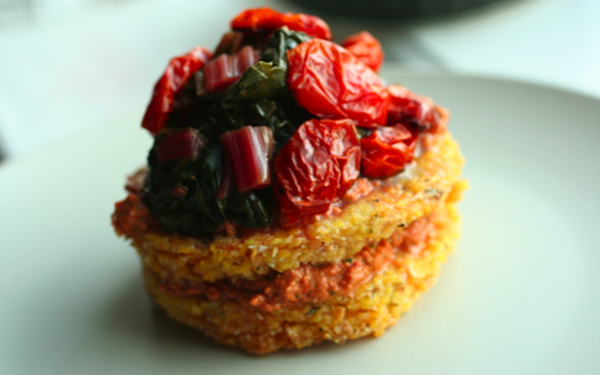 I've never tried polenta cakes but now they are on my radar, thanks to your lovely post! This sounds amazing! I love all the flavors and textures you've created out of this meal, yum! 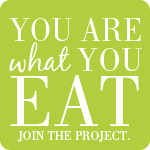 Have you bought or experimented with any new pantry items lately that you recommend checking out? Hi Chris. What type of pantry goods exactly? I keep my pantry stocked with various whole grains (mostly non-glutinous), dried beans, spices, and healthy oils. Lately I've been digging sun-dried tomatoes. They add such a nice depth and flavor to dishes. Hope that helps! This looks excellent. This reminds me about polenta-I sometimes forget about it. Will definitely get around to giving this a try! Thanks for the tip about frying them in a pan to make them crunchier.